Baru-baru ini saya ada berbual dengan seorang sahabat, bertanyakan khabar tentang ibunya dan antara isi perbualan kami adalah bagaimana untuk menjadi isteri solehah. Apabila saya sudah berkahwin, prioriti dalam hidup saya sudah berubah. Seiring dengan nota perjalanan hidup yang sentiasa berubah, tiada apa yang tetap dan akan sentiasa ada turun naiknya. Kita perlu mengadaptasikan diri dengan perubahan dan apa yang lebih penting perlu didahulukan. Ibu sahabat saya sedang sakit sekarang dan kadang-kala saya teringat akan bagaimana beliau adalah salah seorang tokoh yang memberi inspirasi kepada saya untuk menjadi seorang isteri solehah. Semoga Allah menyembuhkan beliau secepat mungkin. Amin. Ketika saya di zaman universiti, saya pernah tinggal di rumah sahabat saya ni satu malam. Keesokan paginya, kami menolong ibu sahabat saya untuk membuat sarapan dan kemudian apabila hampir waktu makan tengahari kami bersama-sama masak di dapur. Tetapi apa yang membuat saya sangat 'amazed' dengan beliau adalah kerana....... apabila sudah siap masak, beliau mandi, berdandan, memakai baju yang cantik dan kemudian menunggu di hadapan pintu menanti kepulangan suami beliau. Ayah sahabat saya adalah seorang pensyarah di sebuah universiti yang berdekatan dengan rumahnya. Jadi ayahnya pulang untuk makan tengahari. Apabila suami beliau tiba di pintu rumah, disalam tangan suaminya dan diberikan senyuman yang manis untuk suami beliau. Inilah....yang saya tak akan dapat lupakan sampai ke hari ini. Satu nasihat yang tidak ternilai untuk saya yang bukan dari kata-kata tetapi dari akhlak dan adab beliau terhadap suami. Sesungguhnya saya bertuah kerana mempunyai seorang sahabat yang dapat memalitkan keharuman wangiannya kepada saya seperti sabda Rasulullah SAW. Dari Abu Musa RA, ia berkata : Rasulullah SAW bersabda, "Perumpamaan teman duduk yang shalih dan teman duduk yang buruk adalah seperti penjual minyak wangi dan perapian tukang besi, tidak boleh tidak akan kamu dapati dari penjual minyak wangi itu, boleh jadi kamu membelinya atau mencium bau harumnya, sedangkan perapian tukang besi membakar badanmu atau pakaianmu, atau kamu mencium bau busuknya". Semoga Allah merahmati sahabat saya dan keluarganya dengan kasih sayangNya. Amin. 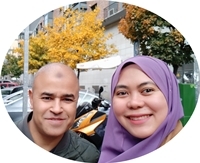 Kembali kepada perbualan kami tentang bagaimana untuk menjadi isteri solehah, sahabat saya mencadangkan saya untuk mendengar slot Pesona D´Zahra dari siaran Radio IKIM (Institusi Kefahaman Islam Malaysia). Pesona D´Zahra ini dikelolakan oleh Ustaz Muhammad bin Abdullah (Ustaz Al-Amin) bersama DJ IKIM membincangkan membincangkan isu-isu rumahtangga dan kekeluargaan. Apabila saya cuba dengar satu slot...secara jujurnya..Alhamdulillah, inilah yang saya cari-cari selama ini. Youtube adalah penyumbang terbesar. Saya telah memuat turun video slot dari Pesona D´Zahra dan menukar format video kepada MP3 supaya mudah untuk saya dengar apabila saya mengemas rumah, mencuci pinggan, memasak dan sebagainya dengan menggunakan telefon pintar saya. Semoga kita sentiasa istiqomah untuk memperbaiki diri setiap hari. Amin. "Kita mungkin telah belajar dalam ilmu lain seperti undang-undang, ekonomi, kejuruteraan, perubatan dan sebagainya hingga ke peringkat ijazah, master, phd dan sebagainya TETAPI ilmu rumahtangga pun kita perlu pelajarinya. 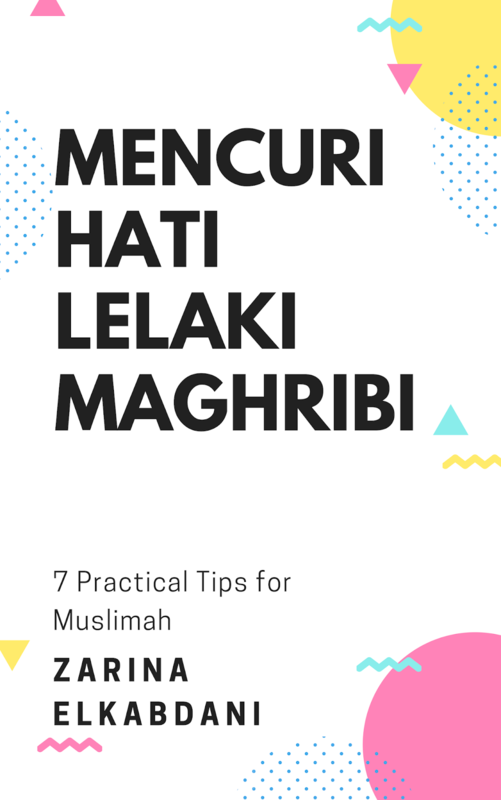 Kita mungkin telah mahir dalam ilmu lain tetapi dalam ilmu rumahtangga kita mungkin di tahap sekolah rendah". Ya...itulah saya, saya masih di tahap tadika. Alhamdulillah, we are blessed yet again to appreciate the pretty season and enjoy the beautiful weather during spring in Madrid. Both of us, pretty much have some common ground hence making our friendship closer. Masha Allah, none of these are achievable without The Almighty's help. Lahaula wala quwwata illa billah. So, what have we been doing on Thursday and Friday, last week (3rd and 4th of March 2016)? She has visited Madrid before but this is her husband's first. We met outside Sol Station, near the fountain (which I totally forgot that there are two fountains exist there! Hahaha...my bad!). I was waiting at the first fountain and they were at the other one. The moment I saw my friend for the first time after two years (I suppose! ), the first sentence jumping out of my mouth was, "My dear, why are you so slim?!" Women! Hehe...the topic of body weight will never cease from our life which annoyed my husband endlessly. 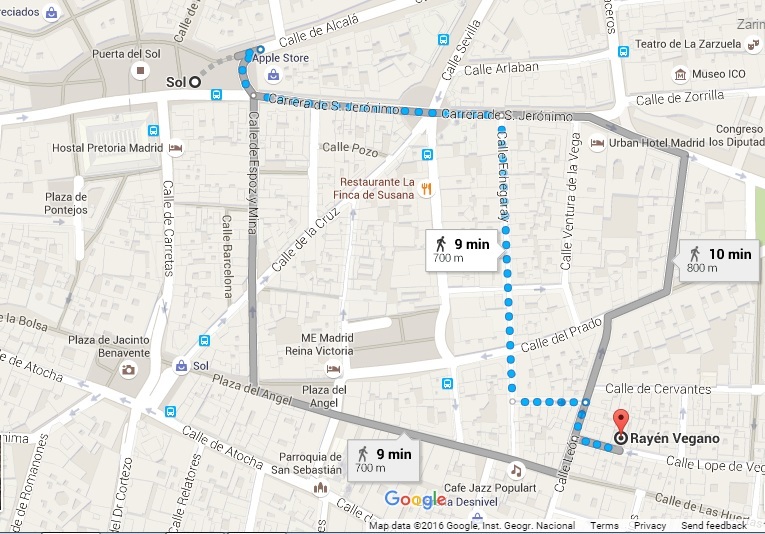 From there (Sol Station), we walked towards a vegan restaurant called Rayén Vegano (Site). Both of them have decided to become vegan after watching a documentary about food production and they just recently started in January 2016. According to Trip Advisor the restaurant receives many fine reviews which made my friend decide to have our lunch there. It took us about 10-minute walk from Sol Station to Rayén Vegano restaurant. Alhamdulillah, the weather was super fine, with good company and good food. Honestly, this was my second time having vegan food in a restaurant in my whole life. The first was in Seoul, South Korea at Living Hut. In Spain, normally during lunch hour, majority of the restaurants offer menu-del-dia option whereby you have a course meal with first plate, second plate and dessert. In general, it is cheaper compared to if you go by ala-carte. Our meal for three was about 40 euros excluding the tip. First we were offered selections of drinks and then the first plate. I opted for Kefir drink. Wait a minute, don't jump to a conclusion at the word of 'Kefir' yet. I forgot to snap the first plate, but here is the second plate. 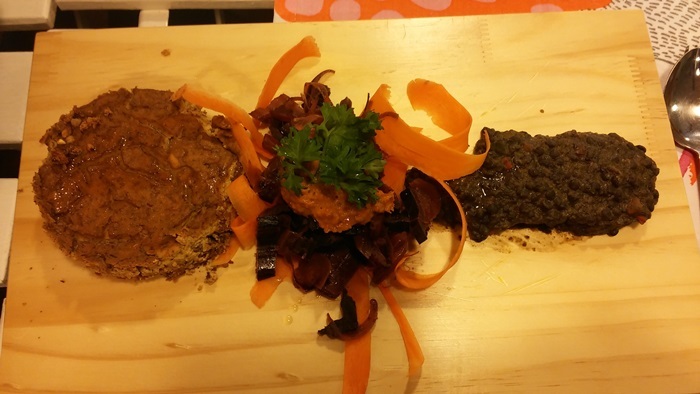 Tofu cake, some salad and lentils. Love the lentils...spicy, yummy! For dessert, I had Americano coffee to go as my oh my..I was full (Alhamdulillah) and the queue outside was quite a number. I was quite pleased though by the Spanish acception towards the concept of Vegan and vegetarian. Well..Jamón is a major favorite here. I really wish that they are stronger rule like in the UK where the food products for vegan or vegetarian are clearly labeled. We Muslims definitely will be blessed with such options nonetheless. Not bad, the taste was not weird at all as I presumed. I LOVE LOVE LOVE vegetables so I have no major issues on eating the same as my friends. Lovely taste with spices which we tried to guess during our meal and definitely intrigued our taste buds. Given a second chance, I would definitely go again. My only concern is the Kefir drink. The moment I had the first sip, I looked at my friend and said,"Do you think there is alcohol in here?" She said the same as she knows the taste of alcohol but how did I know? For Muslims, you may read here to know the ruling on drinking Kefir. Well...It went back around year 2008 when I had my first drink, ACCIDENTALLY. I love having a meal at the Japanese restaurant in Malaysia and one day, I went with my colleagues and most of them were non-Muslims. They ordered sake. When we continued for our next item, cinema, my colleague transferred the content of the remaining unfinished sake into a mineral bottle. After the movie came to an end, I told my friend that I was really thirsty and my friend gave me 'the' mineral bottle thinking that it was 'normal' mineral water. I gulped it..HORROR! The moment the liquid entered my mouth, it BURNT my tongue because...I held the liquid for about 3 to 5 minutes, running to the nearest garbage bin and disposed the said liquid. My tongue had that burnt sensation for the whole day. Astaghfirullah al azim. However, this precious experience made me aware more and my tongue is more sensitive now after that incident. Due to this, I asked the waitress in Rayén Vegano whether they serve alcoholic Kefir drink. She said it is fermented drink. I wondered what Kefir is really. The drink remained untouched after that as I decided to gain more knowledge about it rather than being ignorant. Here is a detail explanation of fermentation of Kefir drink and its alcoholic content. HOWEVER, as a Muslim...we have to avoid alcohol or intoxicants as it clearly brings more harm than benefit as stated by many verses in Al-Qur'an where Allah prohibits them. More discussion on Allah's wisdom on prohibition of alcohol can be read here. After our lunch, we walked towards Retiro Park to enjoy the sun and the lovely views of the lake near the statue. Initially we thought of having a cherry-blossom viewing as there are many more trees there but walking towards the other gate seems consuming little our energy resources..hehe hence we decided to just enjoy the moment. I definitely need a siesta around 3 to 4 in the evening by the time we reached the park. During our relaxing time in the park, my friend asked me of some Malaysian words for her upcoming book about traveling in Malaysia for Korean readers. I am really really proud of her effort to introduce my country to the world! She and her husband has lived in Malaysia before and they love the culture which make me more grateful knowing these kind spirits. 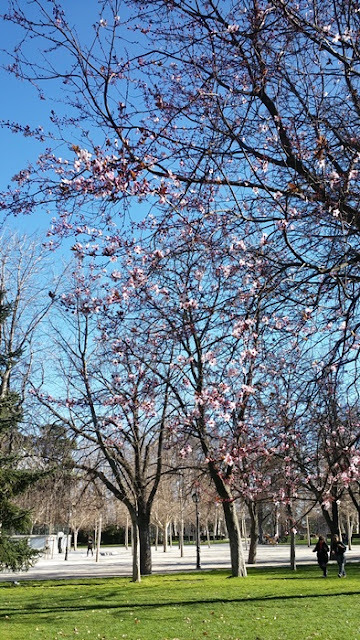 Incidentally, we found a lonely cherry blossom tree near our exit of the Retiro Park towards Alcala Gate and snapped some pictures for our memory. Then we walked back towards Sol and for the day, we went our separate ways at Plaza Mayor. only the two of us today as my friend's husband had to meet his friends outside Madrid. 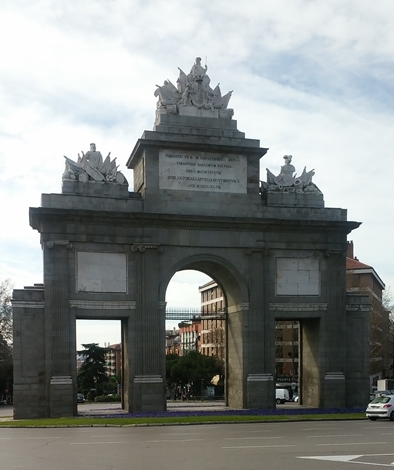 I decided to walk towards Toledo gate today because as far as my personal experience of touring in Madrid (on foot), I have not covered the gate yet. Well...In my opinion and observation, center of Madrid is not big if compared to Seoul. One day or two days is the time needed to enjoy the city if there is no major Museum or Art Gallery hops in your itinerary. We met again at Sol Station at 11am and then just enjoyed our 'camino'. 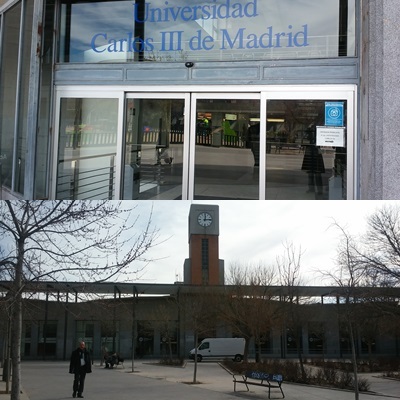 I found another campus of Carlos III University near Toledo gate. Later, we tried to find our way towards Lavapies but I failed miserably..hehe. Instead of Lavapies...we saw Tirso de Molina station instead. Here, we stop for a while for our coffee break. I had my cafe con leche (coffee with milk) plus a croissant for 1.60 euro (promotional price) and my friend, cafe con leche de soja (coffee with soy milk) for 1.20 euro. I am still trying to get used to the idea of my friend being a vegan so as not to offend her when I forgot that there are milk in the coffee and butter in the croissant. Strict vegan does not consume milk, butter and eggs. Then we walk towards Atocha and saw a Turkish restaurant where my friend bought her lunch of Falafel kebab sin the yogurt sauce for 4.00 euro (3 falafels inside). 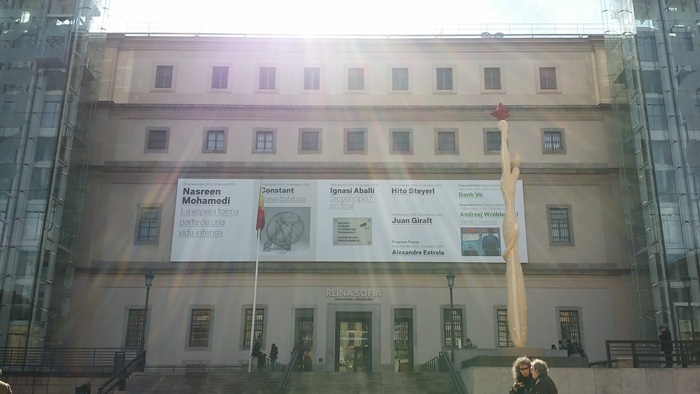 We stopped to eat our lunch outside Reina Sofia Museum and Subhanallah, the weather was really fine and I for once, thought that if spring in Madrid is always like this how marvelous can that be. 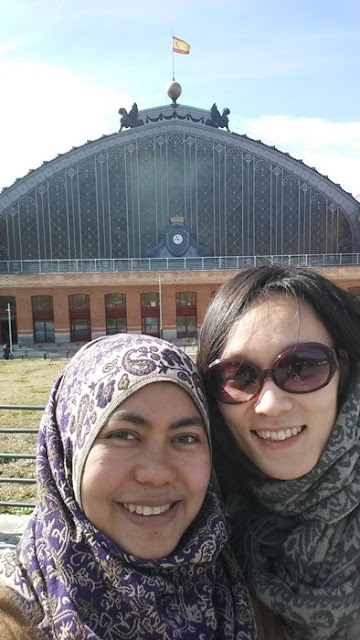 We parted our way at Atocha Renfe Station around half past three in the afternoon as my friend and her husband would ride AVE train to their next location, Barcelona. Anyeong, chinggu! 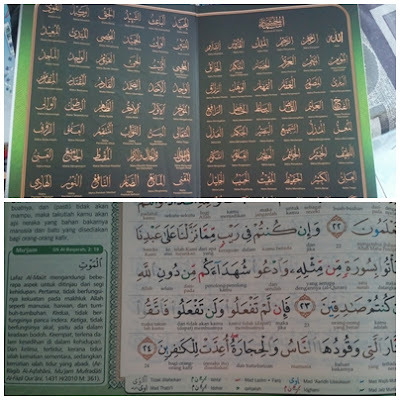 Alhamdulillah, I am now able to recite surah Al-Mulk without looking at the mushaf and to be able to memorize surah Al-Mulk is definitely a blessing from Allah. This is achieved by Allah's help and after I made an intention to memorize any surah from Al-Qur'an, not a long one though and enough to test the ability of my memorization for my own observation. One day in mid January this year, I was watching a video from Sheikh Fahad Al-Kandari; a series of episodes entitled Guided through the Qur'an (with English subtitles) about the stories of non-Muslims becoming reverts. another series prior to Guided through the Qur'an which is Travel with the Qur'an appeared. Subhanallah, the first episode just struck my inner cord. What have I done with my life so far?! Astaghfirullah. There was so much to learn from the hafizs and hafizahs. Honestly, I didn't know who Sheikh Fahad Al-Kandari was initially and after some researching I came to know that he is a hafiz and an Imam for the Grand Mosque from Kuwait and seriously he does very lovely recitation. Check it out in Youtube! So, I decided to download all the series of Travel with the Qur'an and watch it one episode per day. This is because, I really really want to watch all of them in one whole day but of course we do have primary obligation to fulfill for eg. obligation towards Allah first and in my case, secondly towards my husband. Yours would be different and naturally everyone has their own set of obligations. Anyway, when you find the need to rush...it is normally Syaitan's doing! He will incite the unduly need for speed and make you forget everything that you have learned and especially forget your intention of why you memorize the surah in the first place. Nauzubillah. Well, to start with...after watching a few episodes of Travel with the Qur'an, I decided to memorize surah Al-Mulk. This is because I have been reading the surah every night before I sleep. Bi iznillah. Hence, I feel that it would be awesome if I could recite this without the need to hold the mushaf. First, I need to purify my intention and make a supplication everytime before I start my memorization so that Allah will ease, strenghen me physically and mentally and bestow me success. Why do I want to memorize? To be near Allah and seek His pleasure at all times. Secondly, to choose the right mushaf for recitation. I do have a few mushafs at home but I do not have a small one which is easy on my eyes (the Arabic letters size) and with translation. 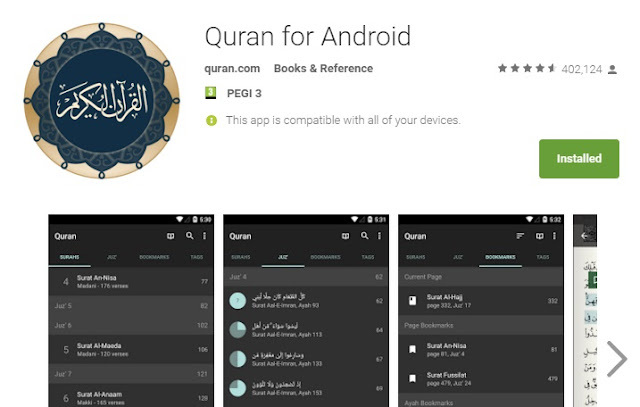 Hence, I am sticking to the Al-Qur'an application from my smartphone as it is easy to travel with. Thirdly, I chose my favorite exemplary reciter. For me, I love Sheikh Abdul-Rahman Al-Sudais. This is because after my father returned from Hajj back in 2011, he asked me to find the MP3 for Sheikh Sudais's recitation of Al-Qur'an as he cried a lot in Mecca when the Sheikh led the prayer in Masjidil Haram, he grew fond of listening to his recitation but he did not know the Sheikh's name. The only clue was that, he heard the Sheikh's recitation before whenever I open it in my laptop. Subhanallah, I already had them way way back then but I did not know the reciter too. Alhamdulillah and from then on, Sheikh Sudais has become one of my favorite reciters along with others like Sheikh Mishary Rashid Alafasy. However, for this particular first journey of my memorization, I will stick to Sheikh Sudais's. From his recitation, I will mark the tajweed location and where should I elongate and what not. I even mimic his recitation to ease my memorization. Fourthly, I stick to Sheikh Fahad's advice to memorize two verses ONLY after every prayer. Yes, it seems very little initially, because.....he knows that the first step was REALLY HARD! Mark my word.. REALLY HARD to maintain your consistency in memorization and you will know why later. My first attempt...I felt all sorts of feelings jumbling inside me. Like for example..why do I need to succumb myself with difficult stuff like this? Oh, dear...why don't you just give up! All of them, are the little voices inside my head. Well...again, tada...our enemy. Syaitan. So...I hold dear to Sheikh Fahad's advices. DO NOT QUIT! At one time, I can't even move on from one single verse the whole day! Hence, I was curious why? why? why I cannot move on? Sheikh google's listed out other hafiz's and hafizah's experiences for me. So, I came to one site. The hafiz's tip is to avoid sin. Hmmm...one major hurdle to avoid. We do sin every single day. Then, I check my whole day's activities what have I done wrong. Did I hurt my husband's feelings unintentionally? Did I procrastinate in Fardh tasks towards Allah? Did I use my time for useless stuff like checking out the latest gossips of artists or did I backbite (mengumpat - women's favorite part time work) anyone recently? Then it struck me! This is one of the miracles of Al-Qur'an. When you try to have it in your heart, it wants a clean place (my heart) and not a dirty place. Automatically, this made me realize now that whenever I want to do something, I should be aware that all my action should not be done spontaneously but with a conscious heart. Subhanallah, this is how Allah wants to teach me and He shows it through the failure of my memorization. From then on, the memorization becomes easier. At one point I could memorize 4 verses in 10 minutes. Alhamdulillah! It was a miracle as I always doubt myself because of my age and many said that it is better to memorize from a young age. HOWEVER, my Creator knows me best! Allahu Akbar. Fifth, I make sure that I understood the translation of the verse before I start memorizing it. 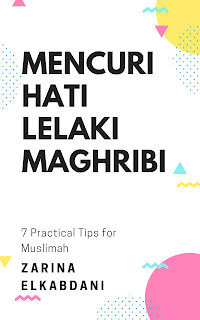 I refer to a few mushafs for the translation, one is the English version, two from the Malay version (Al Qur'an per kata and a normal one) and the third Ibnu Kathir's Tafsir. You should totally check out the virtues of reciting Surah Al-Mulk's listed in Ibnu Kathir's Tafsir. Sixth, I check the Arabic grammar of the verses according to what I have learned in Madinah Arabic classes by Brother Asif. Subhanallah, this has improved my understanding of the verses better as I can understand why the words are like this and like that grammatically. This reduces my errors during memorization greatly. Alhamdulillah. 1-After fajar prayer, 30 minutes memorization. 2-Watch Travel with Al-Qur'an one episode. 3-Whole day, repeat the MP3 of the surah while I'm doing my tasks. If I am outside with my husband, I will recite the verses to him while waiting for the train, in the train and basically, rather than idle talk we will do the memorization together. 4-At night, I will ask my husband to listen to my recitation. Finally, after having completed the memorization, I read the surah during prayer and this is the biggest challenge so far as I do not want to have incorrect recitation when performing the prayer. Alhamdulillah and May Allah help me to be steadfast in this journey, to keep Surah Al-Mulk in my memory and my heart until the day I die. Amin. My next goal for March - Surah As-Sajdah, also 30-verse surah. Bi iznillah.